Learn to play octave scales and you will add a very important building-block to the foundation of your piano-playing skills. You will find octaves written into countless piano pieces from the mid-intermediate levels up to the most advanced. A major portion of advanced-level piano music, whether it's classical, jazz, ragtime, or rock and roll, requires the pianist to have a solid octave technique. One of the best ways to develop a solid octave technique is through playing scales in octaves. You can begin working on your octave scales as soon as you know a few scales, starting with C Major. You will need to start very slow, practicing hands-separately at first. With time and persistence, your octaves will gradually grow more comfortable and confident. You will be able to work towards faster tempos. But do not be in a hurry. Give your hands a long time (in years) to really get the feel for octaves before you try the faster tempos. You need to build a technique that involves dropping the weight of your arms into the keys through your fingertips, while maintaining loose shoulders and arms. At first, your hands may get tired, because they are not used to the stretch. Over time, you will be able to build some endurance, as well as allowing your hands to become accustomed to the shape of the octave. Your work on octave scales also helps with strengthening the images you have in your mind of each and every scale. You cannot play a decent scale in octaves without having a solid mental image of that scale to guide you. Thus, regularly practicing your scales in octaves reinforces the building of those images into your mind, greatly improving your overall understanding and mental mastery of each scale. So, as you devote yourself to working on scales in octaves, your technique is not the only thing receiving major benefits. You are also enhancing your keyboard awareness and your ability to move around on the keys. 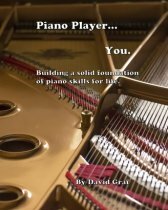 All of this will make you much more confident and capable as you approach the great piano music of the advanced levels. Prior to delving into scales in octaves, make sure you have spent some time learning the basics.